By the acclaimed author of The Soul of an Octopus and the bestselling memoir The Good Good Pig. When Sy Montgomery ventured into the Amazon to unlock the mysteries of the littleknown pink dolphins, she found ancient whales that plied the Amazon River at dawn and dusk, swam through treetops in flooded forests, and performed underwater ballets with their flexible bodies. But she soon found out that to know the botos, as the dolphins are locally called, you must also know the people who live among them. 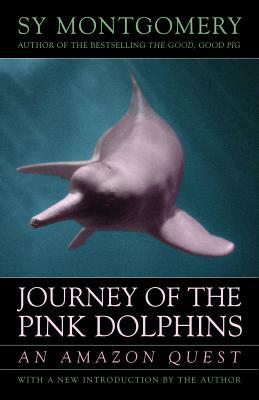 And so in Journey of the Pink Dolphins, Montgomery--part naturalist, part poet, part Indiana Jones--winds her way through watery tributaries and riverside villages, searching for botos and hearing the tales of locals who believe these ethereal dolphins are shape-shifters--creatures that emerge from the water as splendidly dressed men or women only to enchant their human onlookers, capture their souls, and then carry them away to the Encante, an underwater world. Montgomery takes readers on four separate journeys, exploring the river-dwelling dolphins' natural history, chronicling their conservation pressures, unraveling their prehistoric roots, and visiting with shamans who delve into the Encante.